Skoda’s latest family member, the Karoq SUV is set for the Sportline treatment. 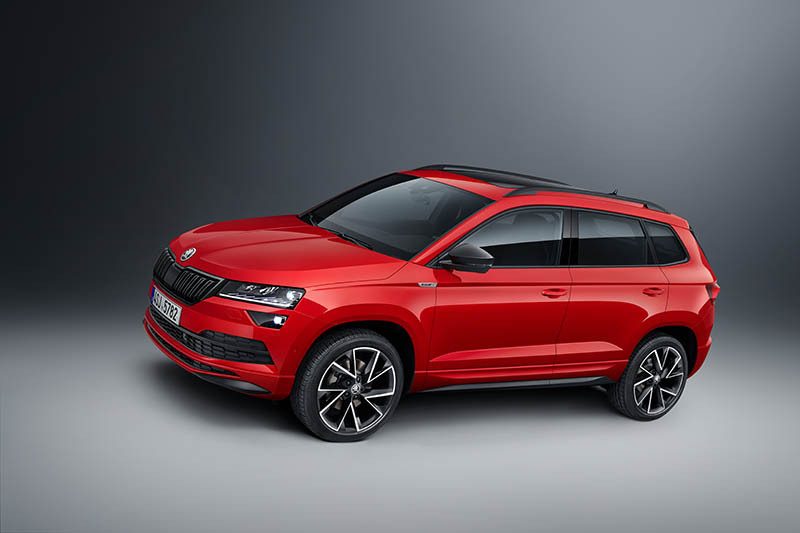 The Karoq, introduced in 2017, is the second addition to Skoda’s SUV range and carries over the brand’s design language into the compact SUV segment. The company says the compact SUV features new innovative technologies including a Virtual Cockpit and features in a Skoda for the very first time. According to Skoda, the Karoq sets the benchmark in its class with infotainment features such as Skoda Connect online services which contain online infotainment as well as proactive services such as automatic emergency call. Sports bumpers and the exclusive black 18-inch ‘Mytikas’ alloy wheels create a sporty appearance. The sporty details continue with Sportline badging, tinted windows and black roof rails rounding off the model’s exterior. The seats are upholstered with revolutionary three-ply air-permeable Thermoflux fabric, which brings extra comfort to passengers, especially in summer and the front seats also feature lumbar support, Skoda adds. The multifunction sports steering wheel is covered with perforated black leather, again with silver stitching. Pedals with stainless steel elements, a black headliner and black roof pillars complete the sporty interior. Irish pricing is yet to be confirmed but additional specifications such as Full LED Headlights, Reversing Camera, Drive Mode Select and Interior Ambient Lighting are expected to be standard equipment. Irish pricing is set to be announced before the Paris Motor Show in October with Irish vehicles set to arrive in November.